Last Friday I was sitting in a workshop and as I glanced down at my phone, I noticed a new voicemail pop up. I scrolled around and realized it was from the office at Zoe’s school and they had tried to call me like an hour prior. I rushed out into the hall and called the school and when the our secretary answered, she said, “Don’t panic, Zoe is fine”. Newsflash: the fastest way to make someone (me) piss myself is to say “Don’t panic, your Type One diabetic daughter is fine”. I’m pretty sure 12 different diabetes related emergency scenarios went through my head as soon as I heard “Don’t panic”, all of them ended with Zoe getting jabbed with Glucagon. We’ve never used the Glucagon before, but I find the entire concept terrifying and I find it even more terrifying when I am 800 miles away. 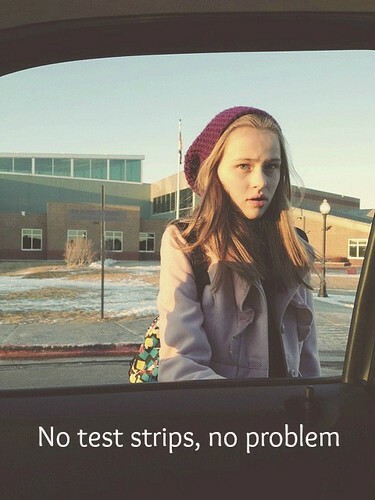 The secretary informed that when Zoe came into the office to check her blood sugar before lunch, she opened her container of test strips and had the grand total of ZERO strips. I checked the container before I left on Thursday, like the Diabetes Supply Creeper that I am, and I restocked her needles, changed her lancet, and noted that she had six strips left. I almost switched it out with a full container, but I thought, “She will notice and grab a new one”, you know, like she always does. And she totally did not. The secretary said when they couldn’t get a hold of me (in Texas), they called the district nurse and they collectively decided to just dose Zoe for her lunch without checking because hello, no test strips. Please note that J, who was on vacation last week, was sitting at home with Troy approximately three miles away from the school and had access to all the test strips. And a car. After I finished my heart attack, I informed the secretary that Zoe also carries a back up testing kit complete with test strips in the front part of her backpack that is for emergencies and she should probably go do a check and p.s. let’s keep the emergency testing kit in the office. 1. Always make sure you have test strips. 2. If your mom is in Texas and your dad is home where we keep the test strips, you should probably call him first. 3. This is how you get your mother to live with you in college, ZOE. engines for not positioning this publish higher! Come on over and discuss with my web site .